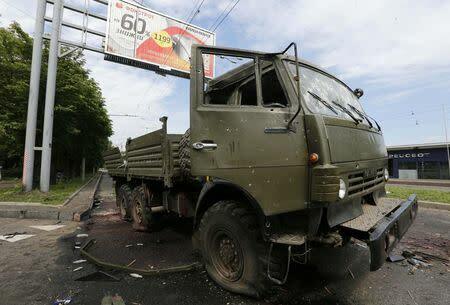 DONETSK, Ukraine, May 27 (Reuters) - Ukrainian aircraft and paratroopers killed more than 50 pro-Russian rebels in an assault that raged into a second day on Tuesday after a newly elected president vowed to crush the revolt in the east once and for all. The unprecedented offensive throws a challenge to Russian President Vladimir Putin, who has said he reserves the right to defend Russian speakers under threat, but whose past assertions that Kiev is led by an illegitimate "junta" were undermined by the landslide election victory of billionaire Petro Poroshenko. "From our side, there are more than 50 (dead)," the prime minister of the rebels' self-styled Donetsk People's Republic, Alexander Borodai, told Reuters at the hospital. Shooting carried on through the night, and on Tuesday the road to the airport bore signs of fighting. Heavy machinegun fire could be heard in the distance in mid-morning. On the airport highway, a truck - the kind that rebels have used to ferry dozens of fighters across the region - had been torn apart by machinegun fire. Blood was sprayed across the road and splattered on a billboard seven meters above. "The airport is completely under control," Interior Minister Arsen Avakov told journalists in the capital Kiev. "The adversary suffered heavy losses. We have no losses," he added. Borodai, the self-proclaimed rebel prime minister, also said the airport was now under government control. Inside the city of a million people, where normal life had previously carried on despite the crisis, there was a new climate of fear. Firefighters battled to put out a blaze at a hockey stadium torched during the night. The Organization for Security and Cooperation in Europe said a team of four of its monitors - a Dane, an Estonian, a Turk and a Swiss - had gone missing after approaching a road checkpoint near Donetsk on Monday. 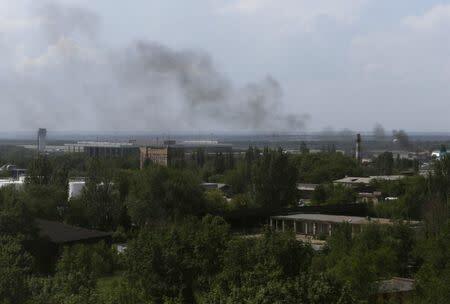 In early May, pro-Moscow rebels held a team of seven OSCE monitors for eight days. The battle marks the first time the government has unleashed the full lethal force of its aircraft and ground troops directly at the Donetsk rebels, a group of local volunteers and shadowy outsiders led by a Muscovite that Kiev and Western countries say works for Russian military intelligence. Moscow says the rebellion is purely local and it has no control over the fighters. In his victory news conference, Poroshenko promised to invigorate the government's stalled "anti-terrorist" campaign, saying it ought to be able to put down the revolt within hours, rather than months. He also said there could be no negotiations with rebels he compared to terrorists, bandits and pirates. Ukraine's future has seemed in the balance since Putin responded to the overthrow of a pro-Russian president in Kiev in February by declaring that Russia had the right to defend Russian speakers and swiftly annexing Ukraine's Crimea peninsula. Moscow's consistent message has been that the government in Kiev, which took power after President Viktor Yanukovich fled an uprising by pro-European demonstrators, was an illegitimate "fascist junta" and Russian speakers were in danger. But that argument was undermined by the victory of Poroshenko, who served in cabinets under both Yanukovich and his anti-Russian predecessors, and campaigned on his reputation as a pragmatist capable of bridging the deep east-west divide that has been Ukraine's greatest weakness since independence. Poroshenko became the first candidate to win a presidential election with more than half of the vote in a single round since 1991, when Ukrainians first voted to secede from Moscow's rule. Although separatists managed to prevent a tenth of voters from reaching polls by blocking the election in two eastern provinces, his margin of victory left little room to question his legitimacy. He was helped by calls from potential rivals for voters to unite behind the frontrunner. The Kremlin said on Tuesday Putin had called for an end to the Ukrainian military campaign and for dialogue between Kiev and the separatists. Putin was speaking in a telephone call with Italy's prime minister, his first reported comments on Ukraine since Sunday's election. 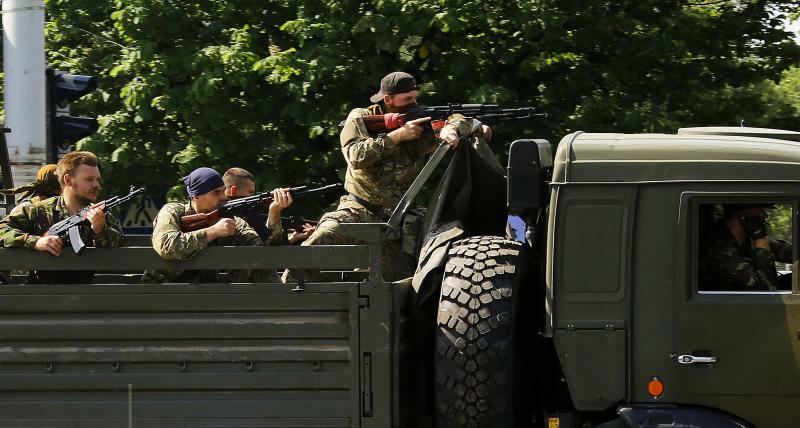 The separatists have repeatedly pleaded for Putin to send his forces to aid them. Since the annexation of Crimea, Putin has turned the protection of Russians in other former Soviet republics into a central theme of his rule. Last month he began referring to eastern Ukraine as "New Russia". But in the run-up to the election his words had become more accommodating. On the eve of the vote, he promised to accept the will of the Ukrainian people. On Monday, before the scale of the latest military assault became clear, Moscow said it was prepared to work with Poroshenko, although it also called for him to call off the military campaign. Western countries say they do not trust Putin's promises not to interfere, saying he announced repeatedly he would withdraw his troops from the border without doing so. The United States and European Union have imposed limited sanctions on a few dozen Russian individuals and small firms but have said they would take much stronger action, including measures against whole swathes of Russian industry, if Moscow interfered in Sunday's Ukrainian election. In another sign of confidence since Poroshenko's election, Kiev pressed a claim on Tuesday for more than $1 billion from Russia's natural gas export monopoly Gazprom, for gas it said Moscow had "stolen" when it annexed Crimea. Russia has threatened to switch off Ukraine's gas from June 3 unless it pays Gazprom upfront for supplies. Moscow wants to charge Kiev far more for gas than it charges European countries. A gas cut-off could hit onward shipments to Western Europe, some of which transit Ukraine.